How did you end up working at crime scenes? 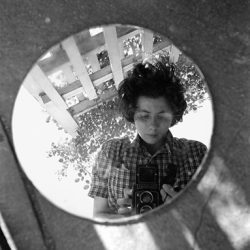 Aleksandrija Ajdukovic: Reportage photography has always been my great love. But reportage photography is not what it used to be, especially when it comes to daily newspapers. As a photojournalist you have a small level of autonomy—the photos you take are published in order to illustrate what journalists or editors want you to say. They rarely end up representing what you actually see on the field. Additionally, reporting from crime scenes wouldn’t have been my choice, but at dailies, the photographers who don’t own amazing equipment are usually either asked to do crime or celebrities. As I am not interested in celebrities at all, I turned to crime. How did Crime Scene come about? Readers want to see blood and tears. The headlines next to crime scene photos usually include words like fear,sadness, or disbelief. Then there is also what I like to call death tourism—taking photos next to certain objects or at locations where a death has occurred. So I thought I should try to insert myself in these scenes and see how people react to that. The reason why you can seem me smiling in most of these shots is because laughing in the face of death is a natural reaction. 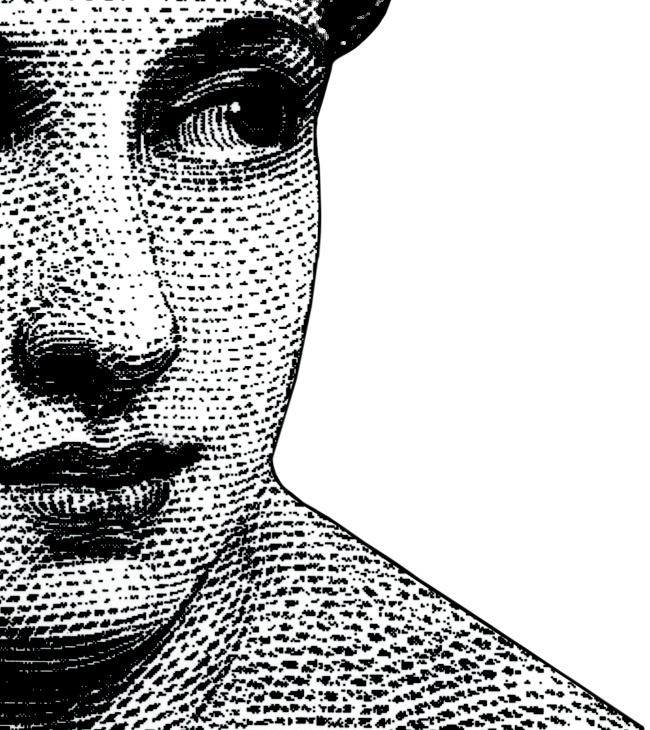 Many people tend to laugh and smile when they feel pain or discomfort—it’s an automatic defense mechanism. 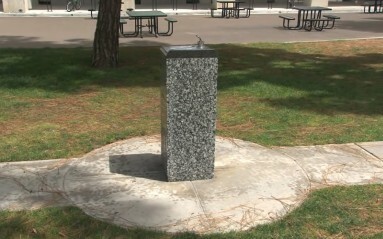 An untitled fountain by the late conceptual artist Michael Asher, created for the university’s Stuart Collection of site-specific art, was reduced to rubble earlier this month when a masked vigilante wielding a sledgehammer rampaged through the campus, San Diego 6 reported. 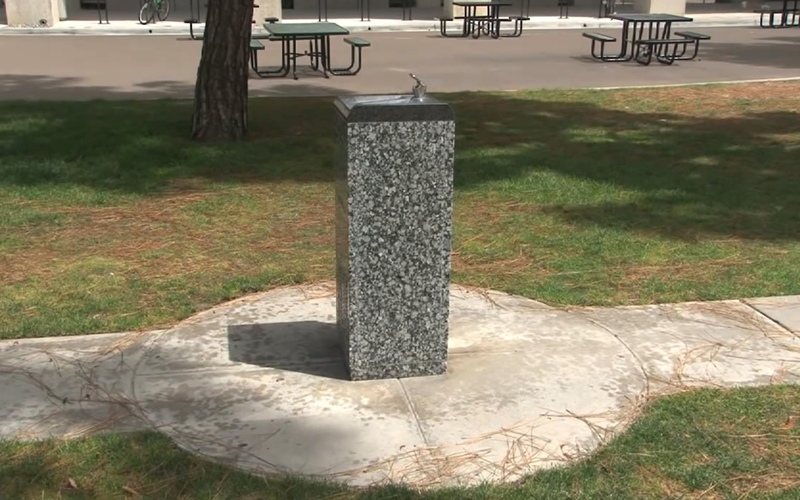 The sculpture, a granite and steel replica of a generic indoor drinking fountain, subverted the conventions of outdoor fountain design while also serving a practical function for thirsty students. 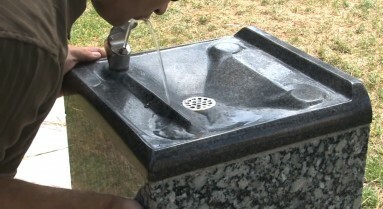 “Many people have a drink out of this fountain without realizing it’s art,” Stuart Collection Director Mary Beebe says in a video about the sculpture. 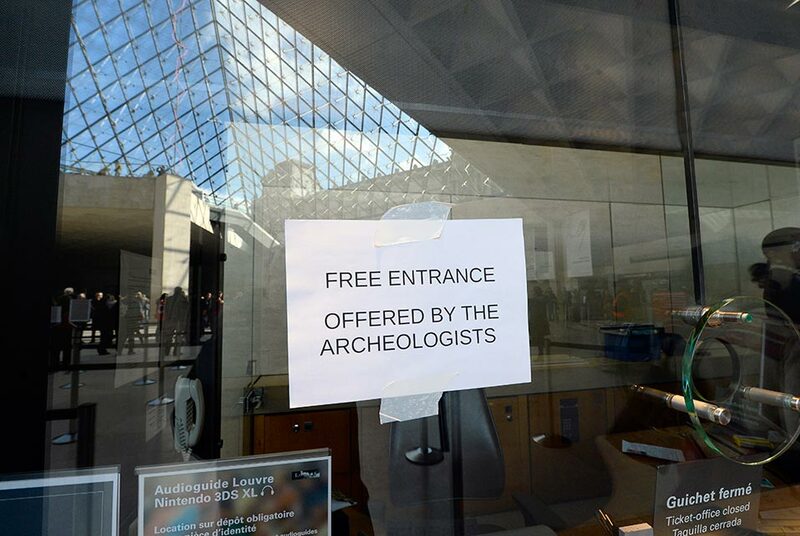 French archaeologists protesting the privatisation of their profession gave visitors free entry to the renowned Louvre museum in Paris Thursday. Around 100 protesters blocked the ticketing area for around four hours in the afternoon, said union member Fabrice Marty. 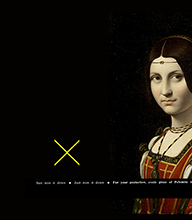 Visitors, who normally pay 12 euros ($13) to see the Louvre’s collection of masterpieces, were therefore allowed to enter the museum for free, he said. A sign posted on a ticket counter window read: “Free entrance offered by the archaeologists”. “For more than 10 years, the privatisation and commercialisation of this sector has led to a catastrophic situation,” said a group of unions in a statement. A convicted tax evader and trout poacher who escaped from the San Francisco federal building last week while awaiting trial on charges connected to his refusal to pay for an $11 million art purchase was arrested Wednesday in Los Gatos, authorities said. Luke Brugnara, 51, was spotted leaving a Los Gatos apartment in a car with a “female associate” about 10:30 a.m., said Deputy U.S. Marshal Joseph Palmer. 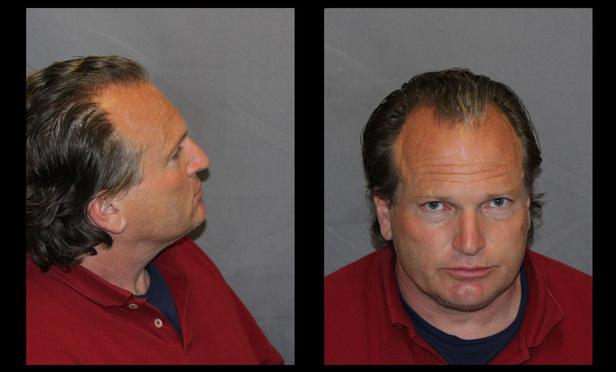 The car was pulled over and Brugnara, the passenger, initially gave a false name, but he was arrested without incident after nearly a week on the lam, Palmer said. Brugnara had been granted time to meet with his lawyer last Thursday in a lounge for attorneys on the 18th floor of the building on Golden Gate Avenue, authorities said. But Brugnara vanished, his attorney Erik Babcock told marshals. Babcock has not responded to a request for comment. A giant anti-police message spray-painted above one of the Southland’s busiest freeways has prompted outrage from drivers and officers alike. 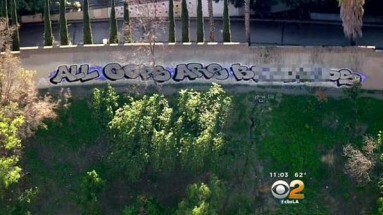 The stenciled and shaded graffiti was put up above the southbound lanes of the 101 Freeway near Vine Street in Hollywood. 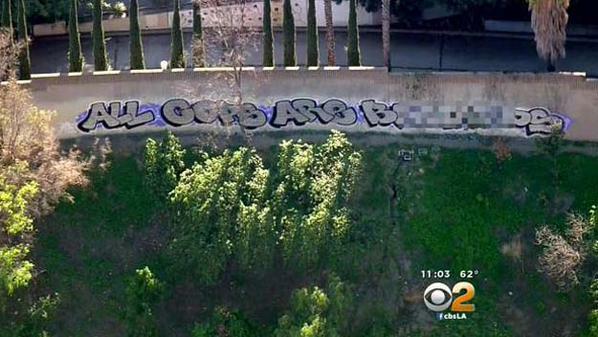 As CBS2’s Peter Daut reports, the large graffiti display was seen by drivers Wednesday, but police and Caltrans were unaware of it until contacted by CBS2. “That’s awful! They should never have wrote that about cops,” said Chase Ahl, a motorist. Los Angeles police Officer Jack Richter told Daut the city spends tens of millions of dollars each year to clean up graffiti. But, he says, this message is unusual both in size and subject. “It’s very offensive to me as a police officer,” he said. “You want to be an artist? Buy a canvas,” he added. 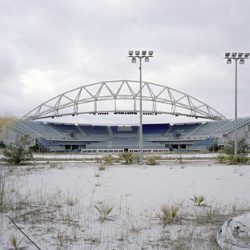 For the architectural photographer Jamie McGregor Smith, the twenty-two buildings left over from the 2004 Athens Olympics have become modern relics, reminding us of Greece's economic crisis as well as the cost of national pride.